The ReFa for Body massages the body, penetrating the skin with micro-currents to improve cell production of elastic fibers and provide a firmer complexion. The Refa for Body performs circular kneading, massaging, squeezing, grabbing, and tughing he skin to increase circulation under the skin and provide firmer skin with a youthful appearance. Using electric micro-currents to stimulate the skin all over the body, this all over tool stimulates skin cell activity to improve production of elastic fibers for a tighter, more youthful appearance with less fine lines and wrinkles. Using to solar panels located on the front and the rear of the ReFa for Body, it generates electricity, infusing the skin with currents to improve circulation and the health and appearance of the skin. The ReFa for Body gently moves in any direction, using four small rollers to glide across the skin’s contours and provide every inch with rejuvenating electricity. The ReFa for Body mimics the motions of a professional esthetician or masseuse, pinching and pulling the skin for improved circulation. With an adjustable handle that can rotate up to 90 degrees for comfortable use, you’ll have no trouble using from head to toe. To top it off, the ReFa for Body is waterproof, so you can take it in the bath or shower for a full body invigorating experience. 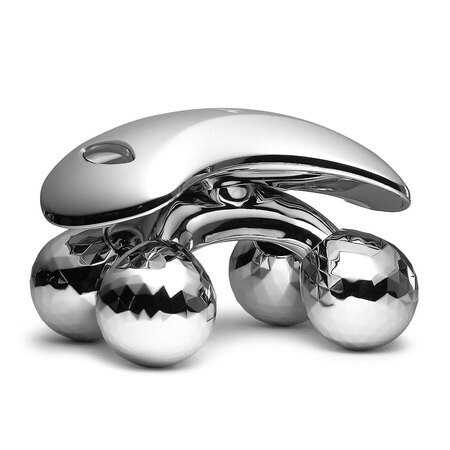 The ReFa for Body is recommended for all skin types, tones, and conditions. The full body electric treatment should be used by anyone who dieters reinvigorated skin with a youthful luster, improved firmness, and a more vibrant appearance. Gently glide the ReFa for Body anywhere you desired, rolling it back and forth across contours to stimulate all areas of the skin.